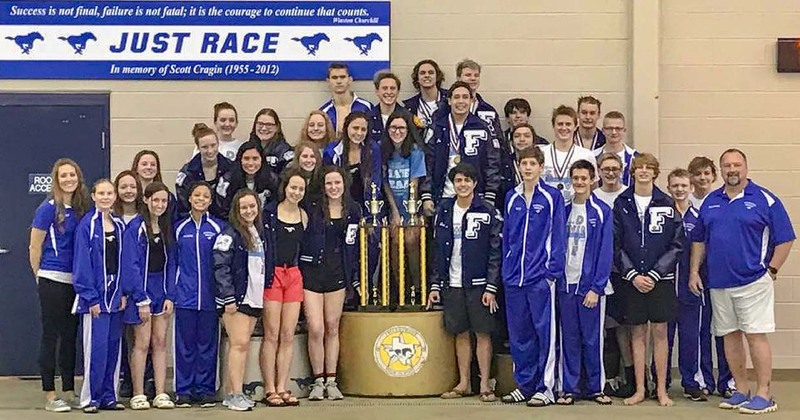 DISTRICT 24-5A SWIM CHAMPIONS - New Friendswood swim and diving coaches Craig Sikkema and Monica Whitsett continued the Friendswood tradition at their first district meet as the boys and girls completely dominated all events to capture the 24-5A crown. The Friendswood boys outscored their competition with 275 points while Barbers Hill finished a distant second with 81 points followed by Katy Paetow (65), Waltrip (46), Stafford (27), and Milby (8). FRIENDSWOOD — For 17 years, Friendswood head swim coach John Little roamed the pool side at Friendswood with multiple trips to the state swim meet. You can't help but marvel at the legendary career accomplishments of coach Little. He won 31 district team titles while being named district "Coach of the Year" 29 times. Little's teams captured 19 regional team championships and he was named Region "Coach of the Year" 15 times. He had 15 teams finish in the top 10 at the state swim meet with two teams finishing as a state runner-up and was named state "Coach of the Year" one time. 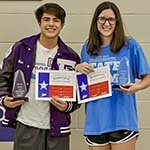 ATHLETE OF THE MEET - Friendswood's Max Hardt and Olivia Theall were named Male and Female "Athlete of the Meet" for their record-setting performances. Hardt won the 200-yard Individual Medley in a new pool record time of 1:53.57. He also won the 100-yard breaststroke in 58.81. Little coached 16 All-Americans and 25 academic All-Americans. He also coached one National Swimmer of the Year with that swimmer setting a national swim record. Little retired last year after another state swim appearance with his team. Now -- a new legacy begins with new swim coach Craig Sikkema and diving coach Monica Whitsett. Coach Sikkema and coach Whitsett continued the Friendswood tradition at their first district meet as the boys and girls completely dominated all events. The Friendswood girls outscored their district opponents with 271 points with Katy Paetow finishing a distant second with 84 points followed by Barbers Hill (52), Waltrip (51), Stafford (23), Milby (10), and Northside (3). 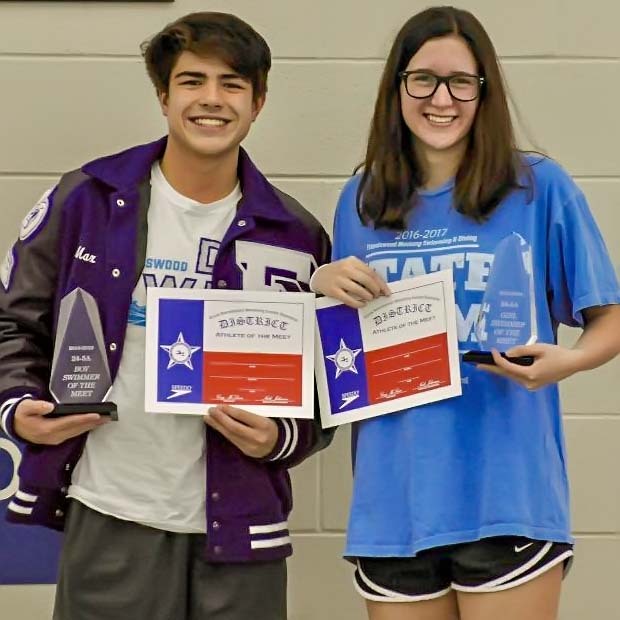 There were some record setting performances by three Friendswood swimmers. Olivia Theall was named "Female Athlete of the Meet" after winning the 50-yard free in 23.15 which qualified her with an All-America time and new pool and team record. Theall also won the 100-yard butterfly in 55.54. Lily Ellis won the 1-meter diving event while setting a new pool and team record for girl's diving with 408.50 points. Max Hardt was "Male Athlete of the Meet" as he won the 200-yard Medley in a new pool record time of 1:53.57. He also won the 100-yard breaststroke in 58.81. 400 Yard Freestyle Relay- Girls Team – Allison Proulx, Leah Givens, Mady Blok, Allie Hansen – Boys Team – Nick Jankowski, Joe Sloan, Nathen Haney, Gabriel Kovach. Diving - Lily Ellis placing first in women's diving. Ellis reset the pool and team record scoring 408.50 points. Gabe Costa placed first for the Mustang men with a score of 369.70. Also advancing to region diving is Caitlin Williams and John Keith. 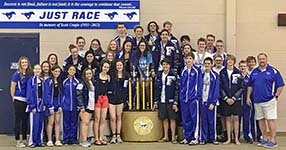 Friendswood will have a strong team competing at regionals to qualify for the state swim meet in Austin.